The response to my book has exceeded all my expectations. The great bulk of this feedback has been enormously positive. The negative reaction has been negligible in comparison. I have found that men have received my book very well. I've begun to feel that perhaps the attitude of men towards women is changing and that there is quite a gap in the perceptions of the urban and rural inhabitants. TDF will work alongside Edhi Foundation as its right arm. Abdul Sattar Edhi’s blessing and faith in TDF will never be compromisd. "The message for the Muslim world is that an era of fear and silence has come to an end. When the meaning of Islam is at stake, it is the duty of every Muslim to defend its intent and essence. By serving that duty, a resurgence of that intent and essence is imminent. The Muslim intelligentsia and scholars, enlightened, peace loving, cultured people, educated youth, women and children, those who have long been silenced by the forces that stole their faith, must break their silence and mobilize against Islam's 'image makers'. Without mobilization the vocal minority will swallow the silent majority. Breaking the silence is the only solution for moderate Muslims to avoid being tarred with the same brush as 'perceived Islam'. It is the only way to differentiate between the two. Moderate rulers, who succumbed to the dictate of official Islam, will have to transmute this catastrophe to redirect their nations towards the Twenty-First century instead of forcing them back into the past. Or else a new Muslim leadership will emerge to mobilize the 'Umat' towards 'Ijtehad'; a reinterpretation of the Holy Quran based on the Original Intention of Islam, rooted in the tradition of Abraham, inspired by the example of Prophet Muhammad(pbuh) and in keeping with contemporary time." 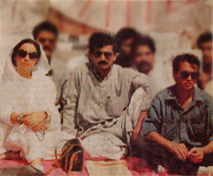 Observing that no political party since Pakistan's inception had raised a voice for the accountability of corrupt public representatives, and recognizing that the silent majority of Pakistan had neither, voice, influence nor resources to make the demand on the affluent, in 1993 Tehmina formed an Issues Oriented Movement, Jehad for Accountability of Public Servants. She went on 'Jehad' a Hunger Strike for seven days. Her demand was meant to create public awareness towards the core issue facing Pakistan's progress and prosperity; through the self- preservation of criminal activity and its wide spread acceptance which had shred the moral fabric of the new generation. Today ACCOUNTABILITY is a household word. "...I moved on from holding ‘one' politician accountable in My Feudal Lord, to demand that all public servants be held to account. I declared ‘Jehad‘ for Political Accountability, in 1993 with the announcement of a hunger strike until the demand was met! 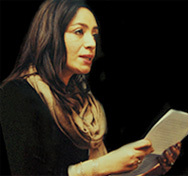 with the objective of creating public awareness towards the consistent violation of article 62/63 of the constitution (which bound public representatives under oath against serving their own families instead of the people), and which crime, under the constitution demanded disqualification under a transparent system of accountability and severe punishment. 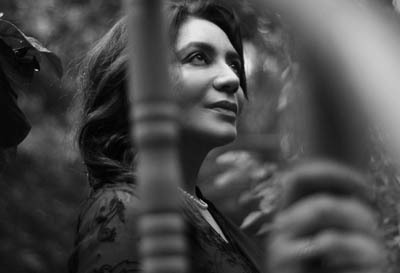 Twenty university students and civilians joined me outside the parliament in Islamabad..."
"In 2001, I launched The Movement, Ana Hadjra Labaek, at the Future Show 3010 in Bolognia Italy. Indeed, at that time it was futuristic to believe that women empowered with an Islamic symbol as proof of their Islamic rights, could move towards a peaceful transition to Islam's ORIGINAL INTENTION through Ijtehad. However, three months later, after the tragedy of 9/11, for me The Movement had commenced. The Holy Quran became a best seller. The crisis of Muslim identity came to the forefront. The toxins from a closed subject were released. The fashion of Fatwa's was over. As all historical change is intrinsic with chaos and anarchy, the rampant aftermath of this transition needed to pass before Ana Hadjra Labaek's time to rise arrived. In 2013 it has." "...It is redundant to state that the current condition of Muslim Women, especially in terms of the self-image they have constructed consonant with the dominant image of a bearded and turbaned Islam is dismal. However long the issue has been debated, the quest for a solution remains. Until the Quran is not re-interpreted in a manner that does justice to its Original Intention women will remain subjugated, not only by men but also by women conditioned by the patriarchal construct of mainstream Islam. Two obstacles need to be crossed. First, the fear of change that will disturb the present balance..."
"...In the year 2002 I faced an 'acid' test for my commitment to Ana Hadjra Labaek. 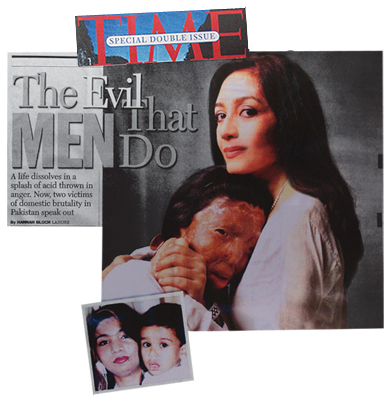 When I stood up to demand the right of identity for two ‘dispensable' Citizens of Pakistan, Fakhra Younas, a dancing girl from Napier road Karachi, a victim of Acid Terrorism and her five year old son Noman, the only sanctuary I could provide them was my own home, where my children, my staff and I were terrorized with life threats and acid, while I confronted the criminals and fought the ‘laws' of an ‘unlawful' military government. Finally after five grueling months, with the support of the Urdu print media and the public pressure it ignited, the government issued their identification papers for travel. In Rome, Fakhra Yunas underwent 30 major surgeries in nine years, at the expense of the Italian Government. In 2012, she succumbed to the excruciating agony of her existence and committed suicide. I received her coffin draped in the Italian and Pakistani flags at Karachi, where Edhi sahib at Edhi home Kharadar led her funeral prayers. Fakhra's son Noman continues to study at school in Rome, and remains under the supervision of an Italian family and myself."